I’m back from my accidental hiatus. For good this time. It’s easy to disappear in NYC, and I don’t necessarily mind, but I also missed it here. That I found myself moving to New York a mere month after returning from Munich I can only attribute to a favorable combination of luck and pluck. That I have managed to survive four months here, well, it’s due to more of the same. I’ve yet to have my first New York City street cry, for example. So, yes, I’m surviving, to say the least, and thriving, at best. It really depends on the day and the amount of good food I’ve eaten. And I really mean that. Due to a combination of Restaurant Week and my body’s desire to enter hibernation mode, I’ve eaten a ridiculous amount of food recently and show no signs of slowing down. 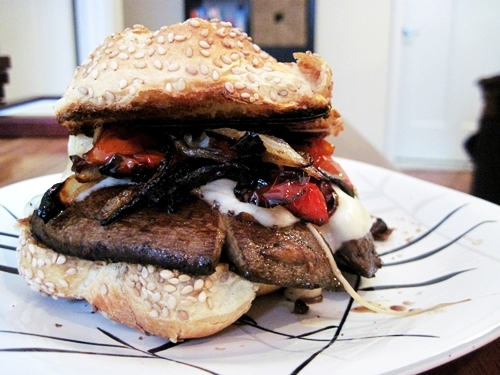 Enter the roasted portobello mushroom sandwich — as close as I’ll get to a detox. I prefer roasting veggies in winter, but this sandwich would be good on the grill come summertime, if you happen to have the luxury of outdoor living space. 1) Preheat the oven to 350 degrees. Remove the stems from the portobello mushrooms and place stem-side down on a cookie sheet. 2) Make the mushroom marinade by combining 3 tablespoons of olive oil, 1 tablespoon of balsamic vinegar, garlic, salt and pepper. Brush or spoon onto the mushrooms. Set aside. 3) Set a pan on medium heat and add 1 tablespoon of olive oil. Add the red peppers and onions. Cook for about 1 minute, then add 1 tablespoon of balsamic vinegar. Lower heat slightly and cook for 20 minutes. 4) Place the portobello mushrooms in the oven once the peppers and onions have been cooking for 10 minutes. Roast until slightly shrunken, about 10 minutes. 5) Remove the portobello mushrooms from the oven. If adding cheese, place the cheese on the mushrooms and put back in the oven for another 2 minutes. 6) Toast the buns and place the mushrooms on the buns. Top with the red peppers and onions.